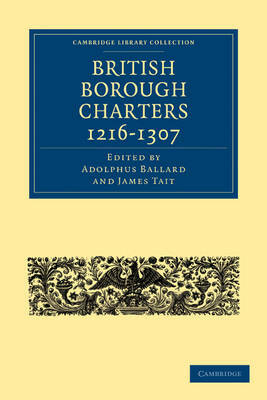 This volume is a continuation of Adolphus Ballard's study of medieval borough charters, British Borough Charters 1042-1216. After Ballard's death in 1915, completion of his work was undertaken by Professor James Tait, (1862-1944) and first published in 1923. Tait follows Ballard's structure from his previous work and divides this volume into two parts. In the first part Tait analyses a comprehensive collection of borough documents and charters dating from between 1216 and 1307 to examine changes in the development of boroughs, burgage and mercantile privileges, and the effect of the growth in trade and trade regulation during this period. Differences between borough charters in the twelfth and the thirteenth century are also discussed. The second half of this volume provides extensive examples of borough documents in Latin, with English translations, including examples of borough formation, jurisdictional, mercantile and tenurial privileges and the development of public services.